(Photo courtesy Walt Disney Pictures) The Sugar Plum Fairy (Keira Knightley, left) helps give a makeover to Clara (Mackenzie Foy), who has landed in a magical land, in Disney's "The Nutcracker and the Four Realms," a movie adaptation of the Christmas classic. 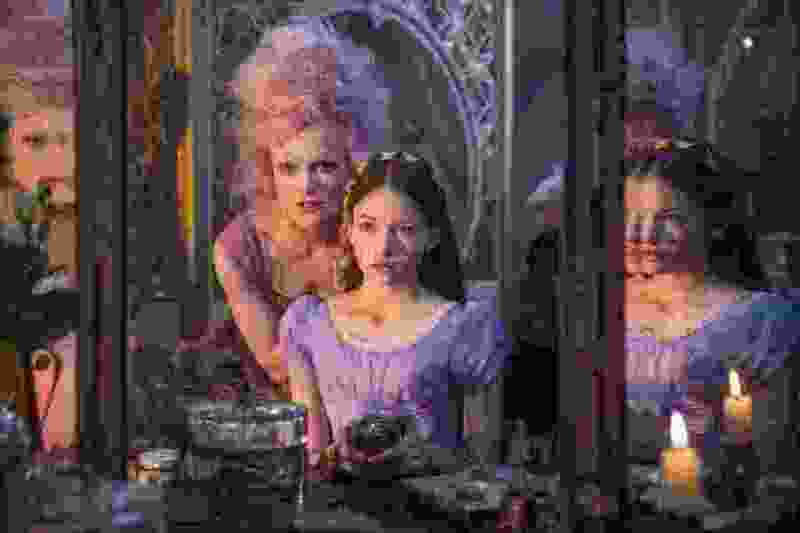 The Halloween hangover has barely begun and Hollywood is thinking about Christmas — with Disney leading the way with the new adventure “The Nutcracker and the Four Realms,” a colorful and frenetic adaptation of the perennial classic. The movie starts with the basics of E.T.A. Hoffmann’s short story and Marius Petipa’s ballet: A girl named Clara (Mackenzie Foy) arrives at a Christmas party thrown by the eccentric inventor Drosselmeyer (Morgan Freeman), whose gift transports Clara to a magical world of snow and fairies and the menacing Mouse King. The challenge with turning the classic “Nutcracker” into a movie, though, is that there’s no actual story. Rookie screenwriter Ashleigh Powell provides one, starting with giving the teen Clara a backstory — her mother, Drosselmeyer’s star pupil, has recently died, leaving her and her siblings, and particularly her father (Matthew Macfadyen), grieving and morose. Powell’s script also gives Clara a challenge, to unlock her mother’s final gift, and her pursuit of a key leads her into the fantasyland of the Nutcracker. Clara — guided by the loyal Nutcracker soldier, Capt. Philip Hoffmann (Jayden Fowora-Knight) — learns her mother was queen here, making Clara a princess. But the kingdom is torn, with the leaders of three of the kingdom’s four realms — Hawthorne (Eugenio Derbez) from the land of flowers, Shiver (Richard E. Grant) from the land of snowflakes, and Sugar Plum (Keira Knightley) from the land of sweets — fearing an invasion from the fourth, Mother Ginger (Helen Mirren) from the land of amusements. Clara and Capt. Hoffmann lead a squadron of soldiers into Mother Ginger’s territory, which is guarded by the Mouse King — actually a mouse-shaped monster made up of hundreds of actual mice, a singularly creepy image for a kid’s movie. Upon meeting Mother Ginger, though, Clara realizes all is not as it seems in this kingdom. The movie is frequently disjointed — possibly the result of being helmed by two directors, Lasse Hallström (“The Cider House Rules,” “The Hundred-Foot Journey”), who oversaw the shoot and post-production, and Joe Johnston (“Captain America: The First Avenger”), who led a month of reshoots. Amid the chaotic eye candy, and a whiplash-inducing plot twist, Foy — best known for playing the vampire child Renesmee in the “Twilight” saga — anchors the story admirably. Ultimately, Clara’s story is about a girl putting aside toys and taking on adulthood, and Foy (who turns 18 in November) gracefully embodies Clara as both a headstrong girl and a maturing young woman. “The Nutcracker and the Four Realms,” for all its trippy elements, is meant for life beyond the multiplex. Like the theatrical production that inspired it, this movie is destined to become a viewing option for families for many Christmases to come. When • Opens Friday, Nov. 2. Rating • PG for some mild peril. Running time • 99 minutes.